BLC_PRODUCT Product A product is a general description of an item that can be sold (for example: a hat). Products are not sold or added to a cart. BLC_PRODUCT_ATTRIBUTE ProductAttribute Defines attributes for a product. 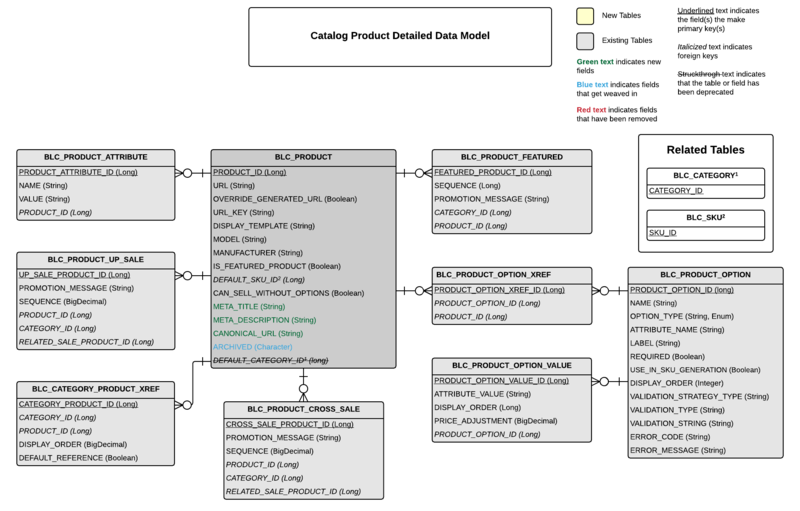 BLC_PRODUCT_OPTION_VALUE ProductOptionValue Defines the value of a Product Option. BLC_PRODUCT_OPTION ProductOption Designates a Product Option. BLC_PRODUCT_OPTION_XREF ProductOptionXref Designates a Product Option. BLC_PRODUCT_CROSS_SALE RelatedProduct Represents the products in the category. BLC_PRODUCT_UP_SALE RelatedProduct Represents the products in the category. BLC_PRODUCT_FEATURED PromotableProduct Represents the products in the category. BLC_CATEGORY Category Represents a category. BLC_SKU Sku A SKU is a specific item that can be sold including any specific attributes of the item such as color or size.